Below I’m going to be explaining to how to keep your Flymo robot lawn mower in tip-top shape. All it requires of you is a few little jobs that are very easy to do and can done within five minutes. Just make sure you follow everything I say to ensure you do everything correctly. I don’t want your lawn to pay the consequences of a poorly maintained mower. Probably the most important out of all jobs is to replace your old, worn blades for new ones. As your robomower will be mowing for days, weeks and months on end, its blades will begin to get blunt. Resulting in a poor cut as the mower will struggle to get a nice clean slice of the grass. First you will want to place the mower is an area of open space that is soft and clean. Then turn if off using the switch at its back. Now put on a pair of protective gardening gloves and turn over the mower so its blades are facing the sky. Once done go get a screwdriver and your replacement blades and screws (you will also need to replace the old screws with the new ones). Now take hold of the rotating disk and unscrew the old blades. Give the area under the old screws and blades a clean before putting on the new blades. When you’ve screwed them in place, make sure they aren’t too tightly fastened by making sure they can still rotate. Now flip the mower back over and you’re all done. In terms of how often you will have to replace the blades, really depends on a few factors – the operating time and size of lawn, the type of grass, the type of soil and the presence of cones, windfalls and other obstacles. The normal timeframe for an area of 300m² is to change the blades every 1 – 3 months. But if you aren’t entirely sure you can just check the blades yourself. Just like a conventional mower, you are going to have to clean this one once in a while. When the weather begins to get a little bit wetter, your grass begin to gather together around your mowers wheels and the rotator disk. Which could then lead to slower mowing time and poorer looking lawn. So it is really important you carry this out on a regular basis and to do so properly. Because you will still come into contact with the mower blades, make sure you are wearing protective gloves. They could protect you from any accidental scratches or cuts. When cleaning out the mower, never you water for the underside and only use a dry brush to scrape off all the grass. This will protect your mower from any damage to the electrical system. For cleaning the top of the mower, use a bucket of water and a sponge to fub off all the dirt. A hose or a power cleaner will only damage the mower. You can also watch this video below that explains and shows you how to properly carry out blade replacement and cleaning. You also need to clean the charging station just as often as the mower itself. Just look out for any twigs, grass, leaves or any other objects that may distrupt docking. And you will also want to check the charging strips (on the charging station as well as the mower). If they appear to be burnt or dirty, give them a clean using fine grade emery cloth. 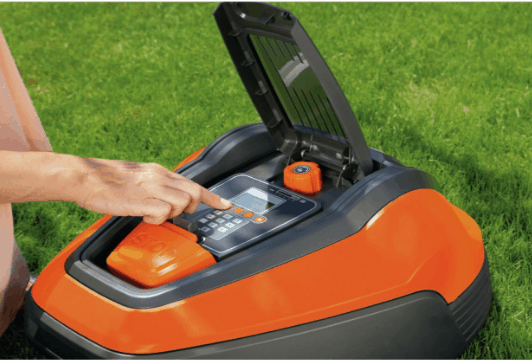 When the mowing season is over, make sure to place you mower (and charging station) somewhere inside. The cold and wet weather can only mean bad things for your mower and there really is no point in leaving it outside as it will be put to no use. Make sure you store it in a dry place where it is not vulnerable to frost. This ensures complete safety for you mower. Also make sure to clean it before putting it awayand check its time and date. Should you buy the Flymo 1200R Robotic lawn mower? Well, as you can see from the above, the Flymo 1200R Robotic lawn mower needs very little maintenance to keep it functioning correctly and performing as it does when new. If you have not purchased Flymo 1200R and are not sure if you should, then check out this Flymo 1200R Lithium-Ion Robotic Lawn Mower Expert Review.